Capsule Summary: Everyone at the 4077th chips in give the orphans a delicious Christmas meal except Charles, who tries to carry on a family tradition in secret. Meanwhile, B.J. goes to great lengths to keep a soldier alive. I’ve long referred to “Death Takes a Holiday” as one of my favorite episodes. Is it perfect? No, but few (if any) episodes are. What makes the episode noteworthy, in my opinion, is how strong the A and B stories are. Both are emotional and powerful. Charles and his chocolates are the A story, introduced at the start of the episode when Charles receives a third big package from home. He later donates a small tin of expensive oysters to the orphan’s dinner, offending Klinger, B.J., and Hawkeye. It’s classic Charles–selfish and snobbish–and completely believable. 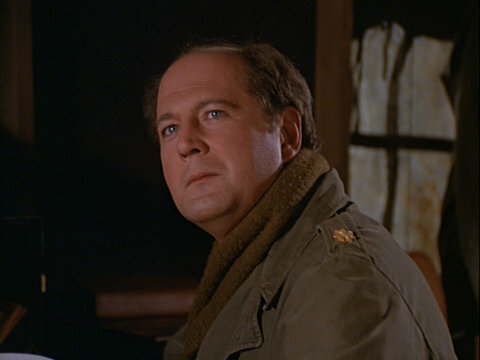 It’s a powerful scene, with a wonderful performance from David Ogden Stiers. There are two problems here. First, I suspect the soldier’s kids will be just as distraught about him dying on December 24th as opposed to December 26th. Every year, for the rest of their lives, they’ll associate the Christmas holiday with their father died. Does it matter if he died on Christmas Eve or Christmas or the day after Christmas? I don’t think so but maybe it does. I don’t know. The second problem is why B.J. struggles to keep the soldier alive rather than simply falsify his death certificate. Margaret and Hawkeye clearly have a problem with going to such extremes to keep a mortally wounded man alive–although they go along with the plan. Ultimately, their efforts fail. Hawkeye forces B.J. to let the soldier die and let Father Mulcahy do his job. Hawkeye then literally moves the clock forward. The soldier, he announces, died on December 26th. During the Christmas party, Igor snubs Charles while passing out cookies. Charles must know why he’s being shunned, and by the look on his face it obviously hurts him. He doesn’t say anything. Keeping his family tradition a secret is more important. It’s a quick interaction, but adds a little depth to Charles. He does care about what others think of him, despite how he acts. Or, perhaps he just really wanted a cookie. I’m surprised Rizzo appears so afraid when Charles grabs him and demands to know where the chocolate bar came from. It’s not often Charles scares anyone. Why don’t Hawkeye, B.J., and Margaret put on scrubs at some point while working on the wounded soldier? They’re not even wearing gloves. Six writers were involved in crafting this script. The story came from writing partners Thad Mumford and Dan Wilcox (the two are credited with an ampersand between their names) with additional input from Burt Metcalfe (who is credited with an “and”). The actual script, or teleplay, was written by Mike Farrell, John Rappaport, and Dennis Koenig. Their names are listed without ampersands or an “and”, which suggests to me they each wrote a separate draft. An excellent episode, with the added benefit of the episode set around Christmas. Charles and his chocolates showing up at Choi’s orphanage added some likability to the episode. Hawkeye and BJ’s discussion of Christmas family traditions really got me. Potter: I hate to hex your Xmas, but I bring bad yule tidings. Our turkey dinner has been trimmed. One of many great lines from a wonderful episode of the holiday season of 1980. One little detail that I like about this episode is that it is the first (and I believe only) instance of Klinger referring to Maj. Winchester by his first name. He also referred to Charles by his first name in ‘Operation Friendship’ – at Charles’ insistence, of course. I was watching this one the other day and couldn’t help but notice the fancy schmamcy chocolate looks an awful lot like toblerone. Then I thought I remembered someone else saying that somewhere but it wasn’t here apparently. It’s a very good episode. They don’t wear gloves because the purpose of gloves is to prevent infection – what does that matter to a dying man? This episode has every single character throwing out puns in almost every line. Even Charles gets in on the pun game which is out of character for him. It’s very distracting and not funny. It’s just lazy writing to try to inject some humor which fails. Puns are the lowest form of humor (so they say) and now we see why. The story is what saved this episode because it’s a pretty good one. Especially Winchester’s arc. His selfless act of charity in bringing the chocolate to the children was just another reason he’s grown on me since I first watched the series some 30 years ago. I resented him initially for replacing Frank who I always found hilarious. But he’s probably the most complex character of the whole bunch and is always surprising me. His embarrassment and uncertainty at the door of the orphanage while he reminisced about his childhood was so touching and so real. Later, when Klinger called Winchester, Charles and gave him that smile at the end, it brought tears. Couple things. Klinger taking off his clothes in front of the kids was a little weird. What was even more weird was how the scared kids were surrounded by uniforms but didn’t mind once Klinger took his shirt off. I also didn’t like how Klinger tried to stop the kids from eating the one thing they were actually interested in eating… Charles’ oysters. Did he forget that Korean cuisine is loaded with seafood so they would probably have enjoyed the oysters? Why spoil their fun? Also, weren’t most of the kids Buddhist during this period? Would they have seen the significance of Santa or Christmas? Still a very nice sentiment though. I didn’t like how Mulcahy bustled in to do the last rites and importantly checked the dying soldier’s pulse as though the doctors might be mistaken about the diagnosis. I did enjoy his telling BJ off about letting him perform last rites. I think it was a bit naive and very schmaltzy for BJ to try to delay the soldier’s death until the day after Christmas so his kids don’t feel bad on the holiday. Considering it’s one day later, I would think there would already be a pall over the holiday anyway. BJ acted like a bitchy baby again and made it about him as he always does. (“He’s MINE” ). No he’s not. Stop wasting medical supplies for a lost cause just because you miss your family on Christmas. If he had no children, would he have just let him die peacefully? Probably. It was painful to watch the kid being kept alive and possibly suffering because BJ had his own things going on. Despite these little things it was still a great episode.